Many people are interested in parasailing. They must have heard of the sport and want to try for themselves the fun and excitement of the recreational sport. Parasailing continues to grow in popularity as it lets the person enjoy the experience of being able to glide and fly through the air. This isn't something that you can do everyday. Thus, the opportunity is really worth taking when it comes. 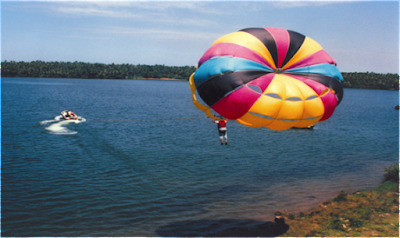 The whole venture of parasailing depends on the mechanisms of devices that exploit the elements of water and air to meet the goals of parasailing. The player will be attached to an open parachute. The parachute in turn is connected to the boat that is moving at a very high speed in the water. The speed will then let the air lift the parachute and the player. As the boat continues the strong control of the speed, the parasailer will remain airborne. Still, there are people who hesitate in doing parasailing because they fear the dangers that could happen. Parasailing is a fairly safe sport. If done properly, there should be no problem at all. To ensure safety at all times, all that is needed is to take care of all the necessary components of the sports. All the proper equipment needed must be secured. They must be in the right shape and condition. There must be guidance from an experienced person all throughout. It should be done at the right place and time with the right weather conditions. One more important element in ensuring safety is achieving the right speed control. The elevation of the parachute and the opportunity to be airborne depend heavily on the amount of speed applied. A speed that is too slow will make the parasailer fall down into the water. Too much speed however can endanger the safety of the player, as well the passengers in the boat. Thus, control is the key to the success and safety of parasailing. The best person to rely on when it comes to speed control is an experienced parasailing boat driver. He or she should have sufficient knowledge, skill and training on the necessary speed to parasail. Thus, it is best to keep in your company an experienced person in parasailing. Trust only the reliable authorities when it comes to speed control. This is your key to safety and worry-free enjoyment.